In this first part, I want to share aspects of my journey from Frankfurt to Berlin, of the protest in front of the German parliament and in part two, I will share with you, our meeting with high officials in the German government at the Ministry of Foreign Affairs and similar responses from Canadian, American and British elected officials who have already acknowledged a commitment to helping Ethiopians in their pursuit of freedom, justice and the respect of human rights. The results of this past week’s events in Germany signal a new receptivity on the part of the German Ministry of Foreign Affairs, the German media and the German public towards listening to the issues of German Ethiopians regarding changing past German policy towards funding the Meles regime, which they consider a dictatorship. Thanks to the efforts of some very committed German Ethiopians, the reality of what was really going on in Ethiopia—genocide, crimes against humanity, corruption, government-sponsored terrorism, tribal apartheid, the harsh suppression of political rights and the potential for a destabilizing backlash—was exposed at new levels in Germany, a key donor to the current authoritarian regime of Prime Minister Meles Zenawi. Openly draconian actions by the Meles government, as they clamp down on any and every indication of resistance or free thought, are also contributing to a damaging, and perhaps irremediable, public image problem. Previous donor countries may not want to sustain the previous cozy partnership with Meles in the War on Terror as he becomes more openly known to be a dictator and perpetrator of genocide and crimes against humanity against his own people. The meeting in Germany is a great example of how a very few devoted people were able to organize a series of events that collectively made a significant impact in our struggle for freedom, justice and the rule of law in Ethiopia. The Ethiopian people in Ethiopia are like an “under-anesthetized” patient, going through surgery with enough of a dose of medication to not be able to move or speak, but not enough to control the excruciating pain. They are screaming, but no sounds are coming out. Now, those Ethiopians in Germany have worked extraordinarily hard and found a way to be their voice; telling them not to have German taxpayers support a government who uses their money to harass, torture, bribe, intimidate and kill. German Ethiopians invited me to be a guest at these events and I was very much honored to take part in what they had planned. I want to share aspects of my journey from Frankfurt to Berlin, of the protest in front of the German parliament and our meeting with high-level German officials. After traveling for over seventeen hours from Canada to Frankfurt Germany, I was lifted up as I left the airport by three wonderful German Ethiopians, Mr. Elias TekleMichel, Mr. Samuel Mekasha and Mr. Tasew Tamiru all of whom I had never met in person, but all of whom I felt I already knew due to their warmth, kindness and their welcoming reception.What I experienced with them is what I have experienced in so many airports and cities where I have traveled and met Ethiopian people who are so caring, hospitable and loving. It is people like this who keep me doing what I am doing, despite the difficulties and challenges in this work. I also know how many more people, just like them, are back home in Ethiopia. This is the beauty and wealth of Ethiopia; something that is at times overlooked when the focus is on our poverty or on our problems. I have experienced this time and time again as strangers turn into friends and then into brothers and sisters. I always say that these meetings with Ethiopians never fail to give me hope that with a new government in place in the future, that was based on principles of “humanity before ethnicity” and “no one is free until all are free,” and people who would work hard to implement such values, Ethiopia could truly become a remarkable government and a flourishing society. The next day, just before midnight, we gathered at an Ethiopian restaurant, prior to taking off on a 700 kilometer bus ride to Berlin. At the restaurant we met with numerous others going with us, but in addition, according to some present, there were also Woyane or TPLF supporters, sitting in the restaurant eating and drinking, appearing somewhat uncomfortable. They seemed to know who I was so I went over to them to say hello and they said hello back to me. Before the bus departed, other Ethiopians joined with us. Some of them had driven up to 400 kilometers from other cities and regions to join us in Frankfurt so we could all drive together to Berlin. I tried to talked to most of them and learn who they were. One was a man who had brought his ten year old son along. He said he wanted his son to learn more about what was going on in the country. A number of the people were those who were still not citizens of Germany but who had filed for immigration status and were still waiting to hear. Everyone had a life story. While on the bus I talked to five young Ethiopian who travel more than 300 kilometers to join us in Frankfurt they were Mikiyas Taddesse Seyoum; Momina Ahmed; Tsige Bekele; Zemen Johannes and Nebila Seid. I talked to a wonderful couple Ms. Hana Abrahm and her husband Breiteweise Schwenfurt who travel 200 kilometers to Frankfurt. I have also talk to other Ethiopians like Belete Kelflie, Tibebu Assefa; Tamane Demissie; Tasfw Tamiru; Alebachew Adugna; Shenaye Abrere; Mengistu Shewasye; Tewdors Tadesse; Eyerus Alem; Betre Lemi; Abera Yibralm who drove over 250 kilometers to join us in Frankfurt. At 9 AM we arrived in Berlin, a city once divided by the Berlin wall, but now unified as one so successfully that one could cross the previous line dividing East Germany from West Germany without even knowing it. Is this not what we yearn for in Ethiopia? It was a ‘Stalinist’ government in East Germany that built the Berlin wall and it was the failure of that Marxist-Leninism ideology that caused the wall to fall; yet, the Meles TPLF government still clings to such ‘Stalinist’ tactics in 2009! Wikipedia defines Stalinism as “a term that refers to the political system of the Soviet Union under the leadership of Joseph Stalin, leader of the Soviet Union from 1928–1953. The term implies an inherently oppressive system of extensive government spying, extrajudicial punishment, and political "purging", or elimination of political opponents either by direct killing or through exile, and it involves a state making extensive use of propaganda to establish a personality cult around an absolute dictator to maintain control over the nation's people and to maintain political control for the Communist Party.” Does this remind you of Ethiopia today under the dictatorship of Meles Zenawi? The receptivity of Germans may be greater because they remember what it was like, only a few years back, to live under or neighboring such a repressive government. As we got in front of the parliament building to prepare for the rally, the TV and newspaper reporters were already present and ready to interview us; asking why we were marching, wanting to know about the Solidarity Movement for a New Ethiopia (SMNE) and wondering what results we were seeking from the German government and public. They were already well-informed on the issues of Ethiopians and had read the SMNE website. One of the interviewers pointed out the difference between German policies towards Zimbabwe and Ethiopia as being totally different even though Meles and Mugabe were the same; questioning the reason for the double standards. We discussed how Meles had been trying to convince Germany, the US and other donor countries that he was the only one who could help fight the “War on Terror,” even though he was terrorizing his own people. I told the newspaper reporter that I hoped that Chancellor Angela Merkel and her government, who have been supporting Meles, would change sides—siding with the people of Ethiopia instead of a dictator because a dictator will finally go, but the people will always remain. I told the reporter that Ethiopians were ready for change, but that we were not asking the German government to do the work for us; instead, we were asking them not to be a roadblock. Deutsche Welle radio then interviewed two of the organizers MS. Asayesh Rauseliel, Mr. Seyoum Habtemariam and me, in Amharic. Our interview was then transmitted back home. They asked similar questions about the purpose of rally, what we wanted as results and what we thought of the new anti-terrorism law. The march caused many Germans and tourists to stop as they were walking or to slow their cars as they drove by in order to find out more about the reasons behind the march. Marchers sang songs, carried the Ethiopian flag and held up placards or shouted out statements such as: “Stop supporting dictators,” “Meles should be brought to the ICC for genocide and crimes against humanity,” Release our political prisoners,” “Don’t side with a dictator,” “Meles committed genocide in Gambella, the Ogaden and elsewhere,” and “No more tax support for guns to a dictator who kills our families!” German police respectfully listened and led us as we peacefully marched to the office of the Minister of Foreign Affairs. What a difference between protesting in a free country as opposed to Ethiopia where the police and security forces may kill you for doing exactly the same thing as we did in Berlin. I thanked the Ethiopian people, telling them that they had advanced the struggle and should be proud of themselves. 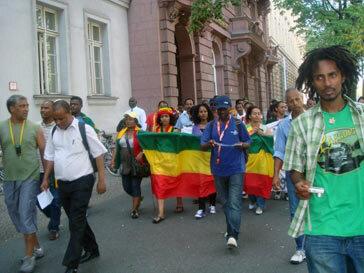 They had become the voice of the people in Ethiopia and the feet of their fellow Ethiopians back home who could not march in Addis Ababa, but who could march, through them, in Berlin. In a companion article, Part Two, I will share with you, our meeting with high officials in the German government at the Ministry of Foreign Affairs and similar responses from Canadian, American and British elected officials who have already acknowledged a commitment to helping Ethiopians in their pursuit of freedom, justice and the respect of human rights. They have some very good advice for us to further our partnership and our effectiveness. May God bring new partners together in effective ways!